Vivi here and I bring my card for the punch and dies challenge!! This is one of my fave themes for a challenge!! love to use punches and dies so I combined both on my card! 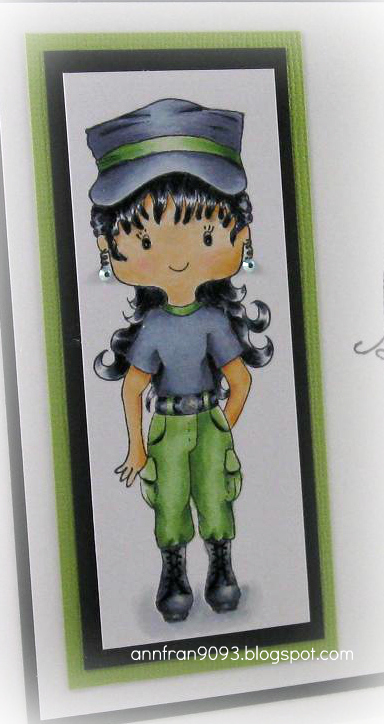 On my card I used florist Gilli from Gilli Stamps and colored her with copic markers R35, R32, R30, R20 E37, E35, E33, E53, E01, E00, B14, B12, B00, C3, C1. Spellbinders: classic oval and beaded oval. I hope you like it and come on over to play with you! Happy Saturday everyone. 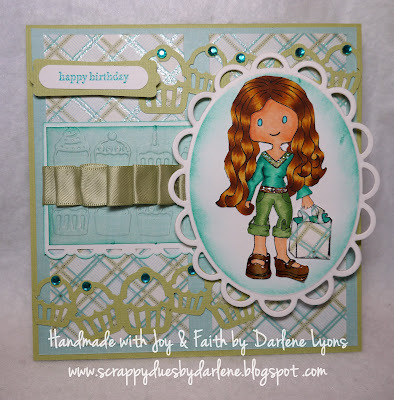 Please welcome our Guest Designer for this month Darlene Lyons. Hi! My name is Darlene Lyons and I live in Ayr, Ontario. I am a SAHM blessed with two beautiful girls Abigail and Hailey and a wonderful supportive husband Todd, who gets the addict I've become since being introduced to scrapbooking five years ago. After having my girls, I needed some "me time" so I dabbled in all types of papercrafting, and loved spending time with others who share the same passion for it. After spending more time at the table than my girls colouring, I needed to find an adult excuse to colour, which I found in Copics!! The only thing I like more than creating is buying the things "I need" to create! lol With the encouragement of some close friends, I started a blog at the end of this past year and haven't looked back once. I am thrilled to be a Guest Designer for House of Gilli and look forward to inspiring you, and being inspired by you, to create wonderful pieces of work! She used Shopper Gilli and isn't she colored beautifully and such wonderful colors. 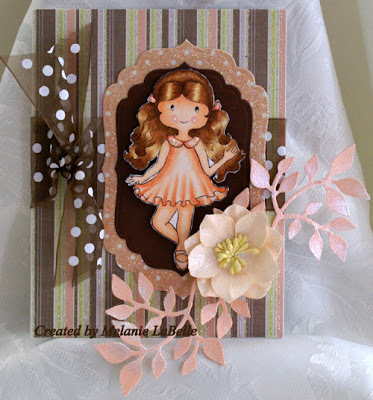 You still have time to enter our Die Cut/Punches challenge, please post your creation below with inlinkz. Also please leave Darlene some love on her gorgeous creation. Keep those gorgeous cards coming! Lollipop Gilli makes me feel like going to a candy shop...or a party....or filling some jars in my house with lots of colorful candy. Jo here today as your hostess for our new challenge this time around at The House of Gilli. The theme this time is die cuts/punches. I love my die cuts. While I don’t own as many as some I do have a few. On my card of have used Lifestyles square dies and Spellbinder oval as well as Cherry Lynn for the butterflies. I have used Girly Gilli II. I changed her up a bit. I have added leggings and long sleeves. I wanted to give her more the look of a dancer. anAry makes her stamps so that you can do things like that. She is colored with Copics. A little stickles to her dress to give it a shiny sheer overlay look. My papers of from my scrap stash so I am unsure of the names of them. Sorry about that. We would love to see your take on the Die cuts/Punches challenge. As always you can use any image but if you have a Gilli we would love to see it. I hope you will join us for the challenge this round. So dust off those dies and punches and join in. Please remember you need to link your card in the Inlinks at the bottom of the page in order to be eligible for a prize. for the Challenge here at the House of GILLI ! that I sent to a friend of mine ! The party theme was Italy, that's why she's dressed in Green, Red and White. Hope you like and participate ! 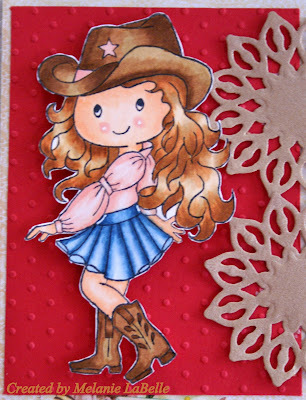 For today's card I used one of my favorite Gilli's (well they are all my favs lol) Cowgirl Gilli, isn't she just a cutie. Shhh don't let my hubby know that I told you this but so far this is one of his favs that I have created so far lol. Please check out the DT creations, they always have something just wonderful for inspiration. 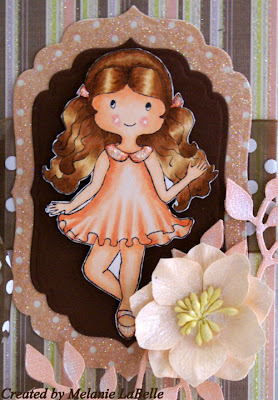 Today it's my turn to play along with our current challenge- Embossing! 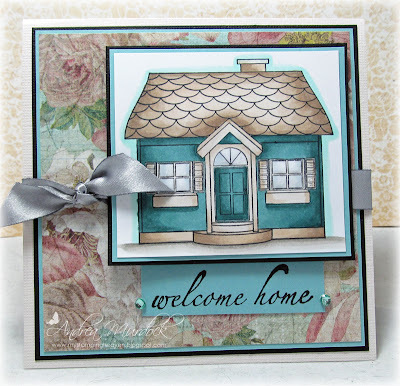 I still had Gilli's house on my craft table from the last challenge (that tells you the state of my craft room hee hee) and I got this sweet and simple card idea as soon as I picked it up! I tried this card idea on a A2 size card (4.25x5.50) but it didn't work at all. Something seemed off and I realized that with the shape of Gilli's house she needed a square card- with rounded corners obviously ;). It worked perfectly! When using embossing powder it is important to prime your paper first so that you don't have a million little bits of your embossing powder everywhere to take away from the clean look of the card. 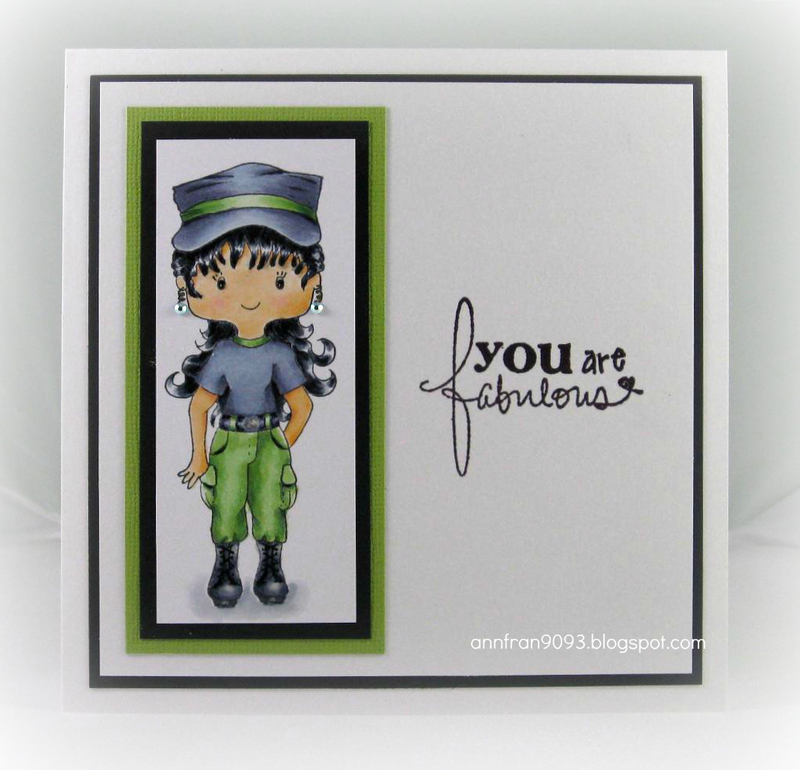 I used a little pouch called an embossing buddy and wiped it all over my card. Be warned if you are using coloured cardstock it can leave a white powdery film on your paper so use a gentle touch. This eliminates the static of the paper and releases the embossing powder except where you want it to stay. For my ink I prefer to use Versamark watermark ink in clear. I ink up my stamp and firmly press it to the paper. I then use some detail embossing powder and pour it over my paper. Don't worry about how much you use as you can pour almost all of it back into your container. When you pick up your card the powder should only stay where you have put the ink. I give a light tap to my paper to further release any random bits that may be trying to sneak onto my card. 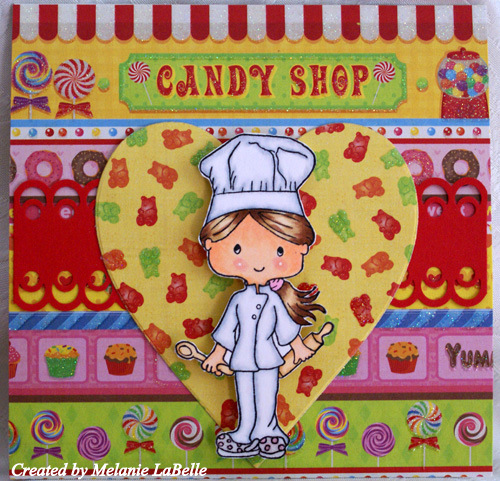 You take your embossing gun to heat the powder and then watch the magic happen! All these years and I still enjoy watching that powder melt lol! I added a sentiment as this card is intended for someone moving into their new home- it certainly would be a special day! I added a touch of ribbon and then whimsy hit me and I cut out some cloud shapes. I ran it through my Xyron sticker maker to add adhesive then I added white fluff and glitter to my clouds to make it pop out from the white card base. I hope you are having fun with our embossing challenge- I sure did! 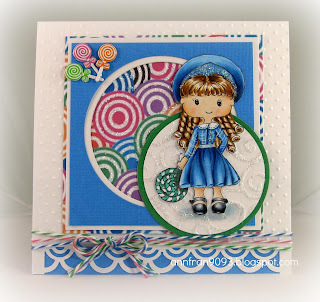 Vivi here and I bring a card for you today for the embossing challenge. This is my first time playing with Renaissance Gilli stamp.. Could not believe, I have this stamp for such a long time and had never inked it up. For the embossing challenge, I have embossed gilli and sentiment images. I inked gilli image with versamark and then embossed with black embossing powder.. I really liked the effect as Gilli looks shining. 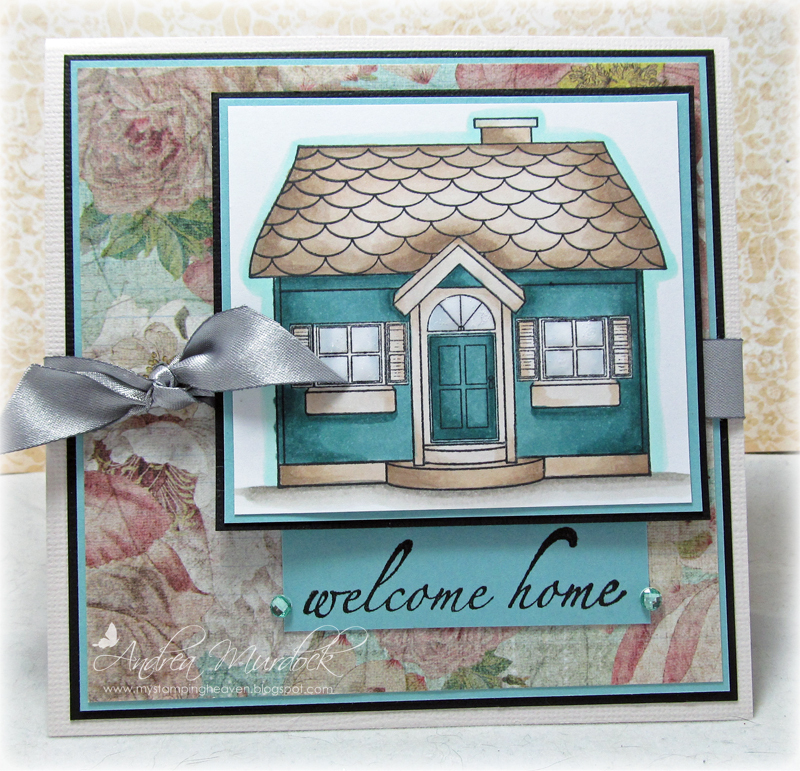 Sentiment is from Stamping Scrapping Designs. this stamp matches perfectly with spellbinders which I used to cut the heart shape. I placed my Gilli on the cardstock cut with nesties. I colored the gilli image using copic markers. Pearl chain, flower, cardstock and ribbon are from my stash. She used Strolling Gilli and isn't she colored beautifully. You still have time to enter our Emboss challenge, please post your creation below with inlinkz. Jo here with my card for the challenge this time around. As you know our theme is Embossing. This could be embossing with your heat tool and embossing powders or it could be dry embossing maybe your cuttlebug and folders or even embossing a brass stencil. I have to confess I don’t do much embossing. It’s not because I don’t have the supplies or can’t do it, I just don’t do it. So this was a good challenge for me to break out some of my supplies and go for it. 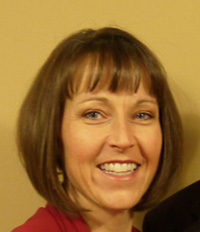 This is Gilli Painter. I love her outfit. She is just splashing design all over. I have embossed some leaves on the DP itself with a violet pearl embossing powder. The verse is also embossed . I broke out my little air brush set from Copic and air brush the ribbon with the same color family I used for Gilli. I hope that you will break out what ever means you have for embossing and show us what you create. Thanks for stopping by today. Don’t forget to enter your card into Inlinkz to be eligible for the prize. It’s located at the bottom of the page. 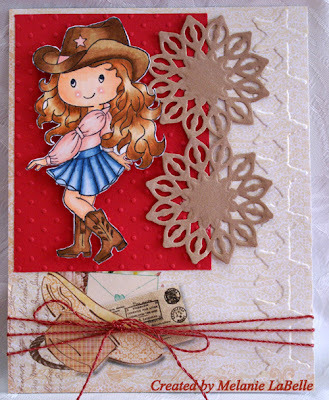 We loved your beautiful sparkle and ribbon cards for our last challenge, and this time our challenge is to emboss. 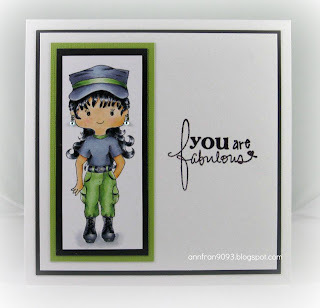 You may use any type of embossing on your card or project and as much or little embossing as you like. I've chosen to emboss my sentiment on my card, and it only took me a few hours to come to this decision. 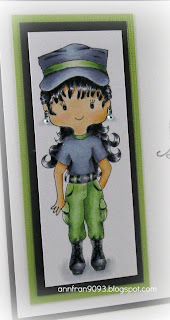 :) My image is Gilli Duty and I picture her all set to go out and do some gardening or walk the dog. I colored Gilli with Copics, but the stamp has lots of nice clean space to paper piece or use whatever type of coloring you love. here at the House of GILLI ! for the Mother's Day on the 2nd Sunday of May here in Brazil. and the ribbon and the flower has got some "sparkle"! Hope you enjoy my idea and participate on this challenge ! Happy Thursday everyone. Lovin' all the beautiful entries so far, you still have time to enter our Ribbon and Sparkle challenge. 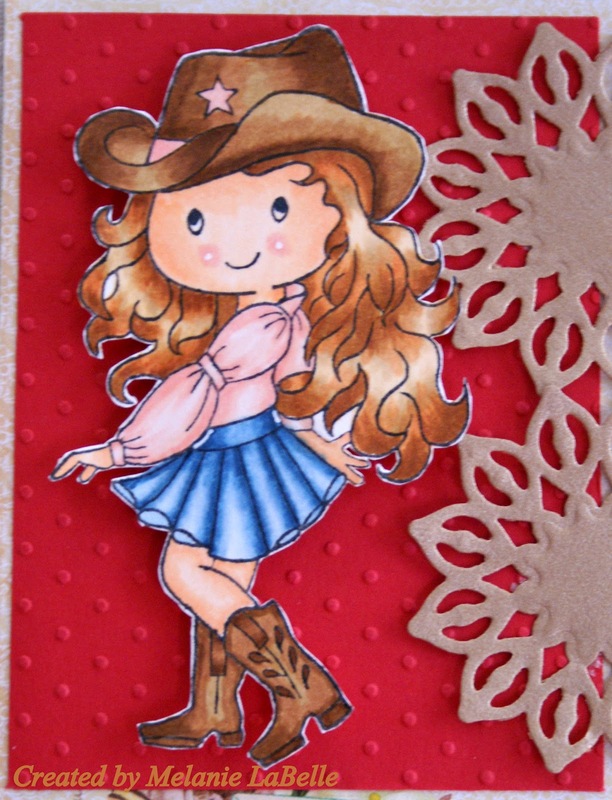 For my card today, I used Girly Gilli 2 which is colored with Copics and I added some Star Dust Stickles to her bows, collar and her shoes for some sparkle. You can also see lots of sparkle in my papers from First Edition/Daydream, gorgeous papers. The leaves were cut from a Sizzix die and sprayed with Perfect Pearls, along with the flower. Hope you will join in on the Ribbon and Sparkle challenge and please stop by every so often to check out what the DT has created. Ribbon and sparkle challenge- Gilli's house! Andrea here to play along with our current House of Gilli challenge! This time I used Gilli's house to create with. I love house stamps- I collect them actually- as I can use lots of 'congrats on your new home' kind of cards. Or like this one- Welcome Home. 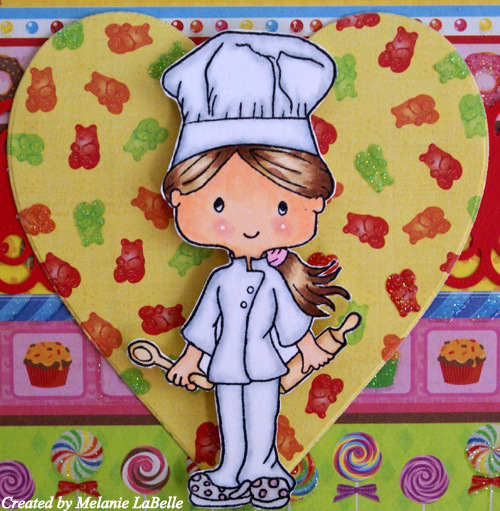 Lots of fun ways that Gilli's house can help you create that special card for someone! To play along with our current challenge I used crystals on my card to add some bling and my ribbon is actually super shiny and sparkly! Perfect! I hope you are having a great week and get some time to come play along with the HOG current challenge!